Obituary* 5 Feb 1969� Mrs. Wylene HOLLAENDER, 75, of 1314 16th St., died this morning at The Medical Center after a brief illness. Born Nov. 22, 1893, in Columbus, she had lived here most of her life. She was a daughter of the late Jesse and Ella Mae CLEGHORN CULPEPPER. A member of Eastern Heights Baptist Church, seh also was a member of the Order of the Eastern Star. Survivors are three sisters, Mrs. Ophelia WADE and Mrs. Mary BATASTINI, both of Columbus, and Mrs. Eva TUCKER of Portland, Ore., and a brother, Wallace CULPEPPER of Columbus....Funeral services for Mrs. Wylene C. HOLLAENDER of 1345 16th St. will be held Thursday 2 p.m. at the gravside in Riverdale Cemetery with Dr. J. D. HILLMAN officiating. Survivors include...several nieces and nephews. Wylene Culpepper, Lodger, F, 25, Sng, GA/GA/GA, Spooler/Cotton Mill. Wallace P. Culpepper, d. 17 Mar 1969 at 58 years in Muscogee Co., GA; Res. in Muscogee Co., GA, 007559. 16 Nov 1913, page 6B and 23 Nov 1913, pages 2B & 6B, Wedding Annoucement of Miss Viola Dunaway and Mr. John Sheppard Culpepper, 20 Nov 1913, Harlem, Columbia Co., GA.
Borgman Culpepper, Son, M, 3 11/12, S, GA/GA/GA. * Viola D. Culpepper, 1885 - 1972. 20 May 1972, page 13A. Obituary for Mrs. Viola Dunaway Culpepper, widow of John S. Culpepper, Sr. of Evans, GA, died 19 May 1972 in Keysville, GA. Interment at Evans Baptist Church Cemetery, 20 May 1972. Survivors include three sons, R. Haskell Culpepper of Evans, J. Raymond Culpepper of Evans, John S. Culpepper, Jr. of Jekyll Island, and a sister, Mrs. Marie Jones of Augusta. 27 Jan 1989, Page 3B. Obituary. Mrs. Hepsie M. Culpepper, 72, of Augusta, died 26 Jan 1989. Interment in Hillcrest Memorial Park. She was a native of Athens, GA and a retied employee of Riverside Mills. Survivors include her husband, Robert Haskell Culpepper; two sons, Thomas F. Threlkeld of Tuscon, AZ, and Ronald L. Threlkeld of Harlem; four daughters (named); three sisters (named), etc. Robert H Culpepper, White, Single, born 1914 in Georgia, residing in Columbia Co., Georgia, enlisted as a Private in the US Army on 9 May 1942 at Fort McPherson, Georgia. 9 Jul 2000, Page 7B GA edition. Mr. Haskell "Hack" Culpepper, 85, of Augusta, died 8 Jul 2000 at Veterans Hospital. Interment 10 Jul 2000 at Hillcrest Memorial Park Mausoleum. A native of Dearing, he was an Army veteran of World War II and had retired in maintenance from Columbia County Schools. Survivors include two step-sons, Ronnie Threlkeld of Appling and Tommy Threlkeld of Augusta; two step-daughters, Venice Jordan and Delores Clark, both of Augusta; and a brother, Raymond Culpepper of Evans. Hepsie M. Culpepper, d. 26 Jan 1989 at 72 years in Richmond Co., GA; Res. in Columbia Co., GA.
Curtis C. Lewis, Roomer, M, 22, md@19, FL/FL/FL, Waiter/Restaurant. Malcolm Culpepper, #34241096, Male, White, Protestant, Staff Sergeant, US Army, was buried at Saint Laurent Cemetery (Permanent Cemetery), Saint Laurent, France, Grave number: b 11 13. Max Culpepper, Lodger, M, 20, Sng, GA/GA/GA, Electrician/Wiring. William C Culpepper, White, Married, born 1915 in Georgia, residing in Dade Co., Florida, enlisted as a Private in the US Army on 18 Jun 1943 in Camp Blanding, Florida. From Esther Miron: "Years ago Louise's oldest son brought it [this photo] up here for my Dad, saying it was Charlie Horace Phillips. My Dad said no, definitely was not his Dad. He said he thought it was "Pappy." Now I'm sure that Pappy was his grandfather, but I don't know which one. I do think it is Jesse Culpepper, since both my Dad and his mother look like the person in the photo a lot." Mary J. Culpepper, Mother, F, W, 73, md@21, AL/GA/SC. Allen D. C. Culpepper, Son, M, Mar 1899, 1, S, GA/GA/GA. Grover Fowler Culpepper, Opp, Covington Co., AL, Age 30, born 6 Oct 1887 in Harris Co., GA. Caucasian. Occupation: Carpenter in Opp, AL; Single with no dependents; No military experience; Medium Height, Medium Build, Gray Eyes, Dark Hair, Not bald, No disabilities; Signed with "his mark", registered 5 Jun 1917. Henry Culpepper, RFD #1, Dozier, Crenshaw Co., AL, Age 21, born 30 Oct 1896 in Columbus, GA; Employer: J. Mitchell; Nearest relative: wife; Caucasian, No military experience, Medium Height, Medium Build, Blue Eyes, Dark Hair, No disabilities; signed 5 Jun 1918. Allen Candler Culpepper, RFD, Opp, Covington Co., AL, Age 19, born 25 Mar 1899. Caucasian. Occupation: Farming; Employer: A. C. Burke; Nearest relative: Alice Culpepper, wife, Opp, Covington Co., AL; Medium Height, Medium Build, Dark Eyes, Black Hair, No disabilities; Signed with "his mark", registered 18 Sep 1918. Allen Culpepper, Son, M, 11, Sng, GA/GA/GA. Mary Jane Culpepper, Mother, F, Wh, 63, md, GA/GA/SC. 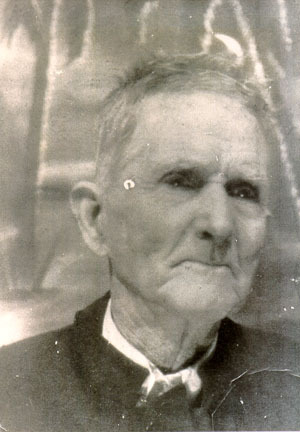 James J. Culpepper died 16 Mar 1950 in Coffee Co., Alabama. Rhoades Church Cemetery, Highway 189 north of Kinston, Coffee Co., Alabama. + J. J. Culpepper (No dates, large grave). Grover Culpepper, Head, M, 23, Sng, GA/SC/GA, Farm Laborer. Grover F. Culpepper, d. 6 Sep 1956 at 69 years in DeKalb Co., GA; Res. in Fulton Co., GA, 20907. Rosser Culpepper, Boarder, F, 25, S, GA/GA/GA, Stenographer. E-mail written 6 sep 2006 to Warren Culpepper from Johnny Warren (s/o Bertha Mae Culpepper Warren), Andalusia, Alabama, e-mail address.